Tags: In which Wabi Sabi documents her creative process and lack of housekeeping skills. Someone rediscovers her 60mm lens. I needed a photo of some “luscious food” to submit for a themed art show. So, with a comfortable margin of nearly 24 hours before the deadline, I hauled an armload of fruit, two cameras and three lenses downstairs to my light table. This took several trips. In a spirit of full disclosure, I will tell you that before I could set up this little shoot, I first had to move many, many piles of last season’s clothing and random bed linens that had chosen to camp out on said table. On the plus side, I found a cache of corduroy pants from last winter that had gone missing and four yellow napkins I thought I’d lost forever. Four kinds of apples and two varieties of pears took their turns on stage. I posed them, spritzed them with water, draped chiffon around them and worked some soft lighting. Nothing. God help me, but I played a little Barry White just to put those Granny Smiths in the mood, but they were not taking a shine to each other. 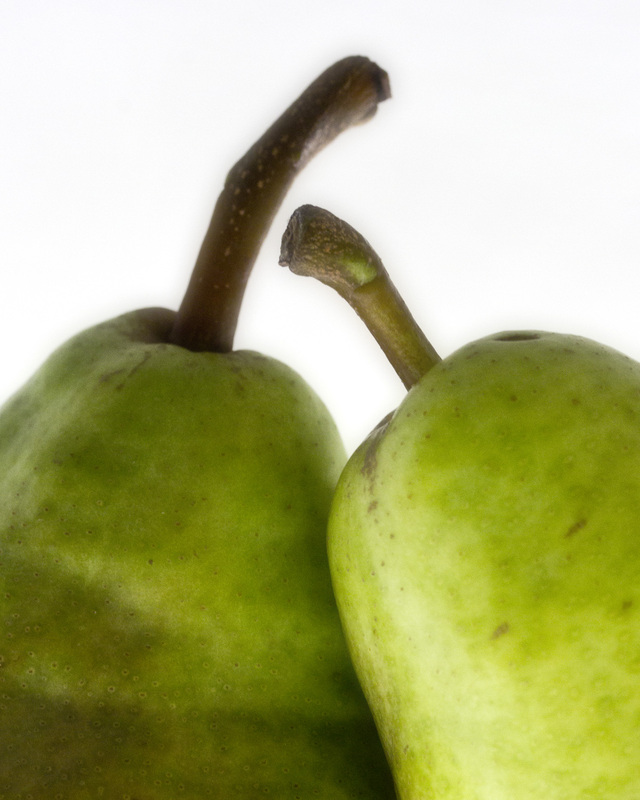 I was okay with this pear couple, but not crazy-in-love. 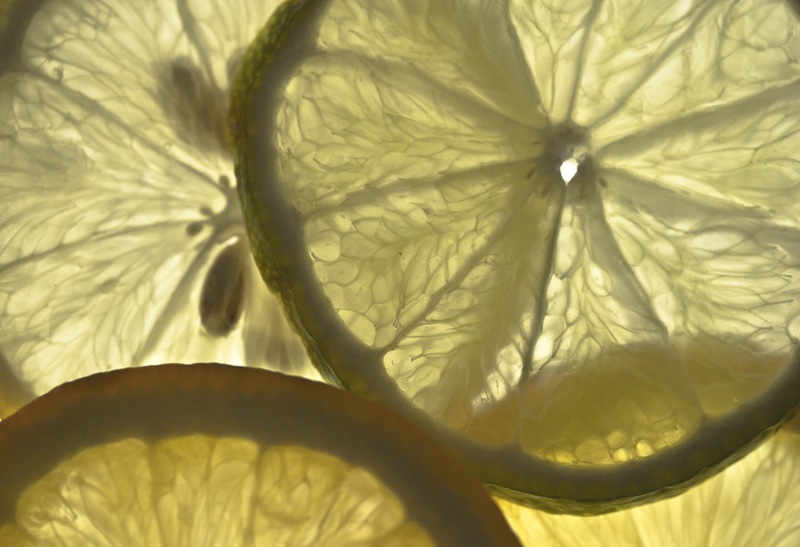 When I couldn’t conjure anything more than tepid chemistry among the assembled models, I finally abandoned my sultry fruit plan and moved on to abstract portraits of citrus fruits. And I’m fine, but not rock-my-world fine, with a couple of the citrus shots. Cathedral window, maybe? On my last trip upstairs to see what other foodstuffs I could play with–slices of pepperoni! half a jar of peanut butter!–there it was. Lovely ripe cantaloupe lounging patiently on the counter. Google-map of Stonehenge? Satellite picture of an Aztec temple? I don’t think it qualifies as “luscious,” but it was my favorite of the afternoon. You bring such delight to my droll cross Wisconsin trip this afternoon. Teaching could never give you this kind of juiciness. I ❤️ the single lemon slice and melon bird’s eye view! I’m finding the melon endlessly fascinating. I found myself loving your last three shots. 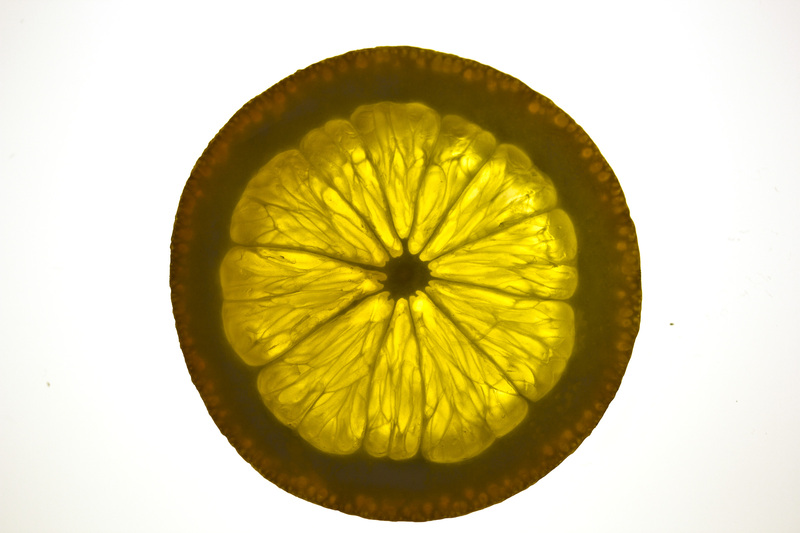 The final pear shot looks like pounded copper art. The cantaloupe is reminiscent of an old Aztec city shot right out of the window of an alien ship. Space alien, not the folks already occupying the planet. Thank you, Karen. It reminds me of the copper piece that you gave me a couple of years ago. I showed Curt and said, “Guess”. He said “African village or a weird mushroom.” Then he wanted to know where you get cantalopes this time of year. If you enter this I think it will need an ambiguous title. Festival. I can’t speak to the flesh, but the exterior is quite nice. I’ve been waffling between “Google-map my melon” and “Come to Me, my Melon-choly Baby.” I really want to work that ancient knock-knock joke in: “Can’t elope tonight, my father’s got the ladder” but that is going just too too far for a punch line title. You are so transparent. It is obvious to me that you are an Anglican minister in real life and this is your busy time of the year. These are just wonderful. 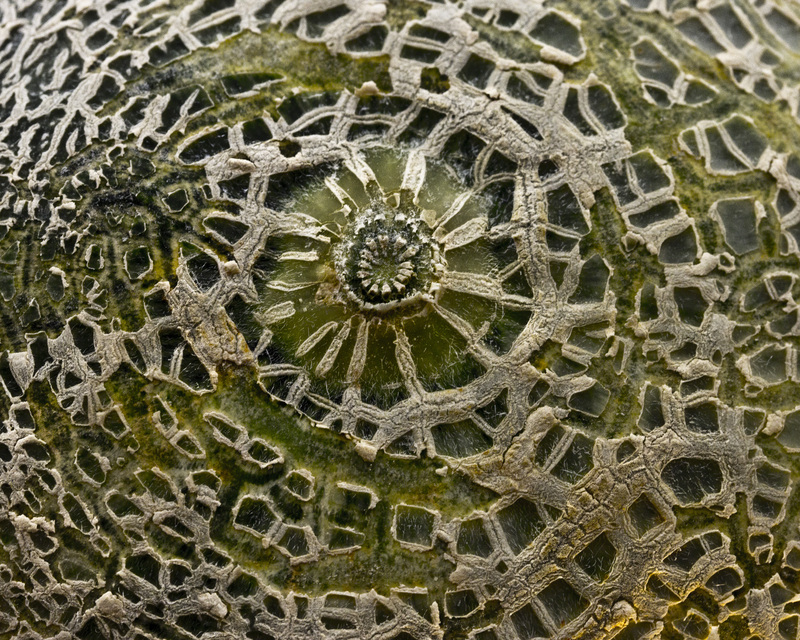 Melon’s intricacy instantly made me think of the interior dome of a grand cathedral and the top of a Martians head. 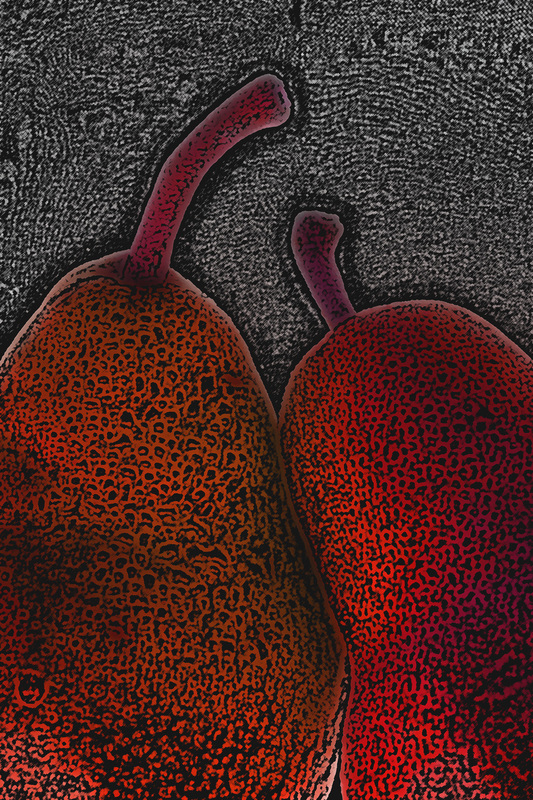 The red hot pears are super! Thank you. I thought lace as well–or maybe macramé given the coarseness. But I continue to go back to the Yucatan Peninsula in my mind. And isn’t it amazing that we work so hard to create a pattern that already exists in nature? Oh a 2nd look at melon…. your programed drone flew over an Inca settlement….yes? Group citrus transparency, no hidden agendas here. But then I am an orange a day sort of guy. And orange you glad you are? No apologies needed. i am marking assignments o any distraction is welcome :). Orange I a procrastinator! Grading papers is my very least favorite task and I put it off as long as possible. You have my sympathy. The melon is mesmerizing. Thank you! The cantaloupe looks like a winner to me. Could be a painting by some famous dead artist. But it’s intriguing. But of course. See? And that’s our conversation about what we see…really see. Why not use this as a starting point?